The Board granted a petition for cancellation of a registration for the mark NAUGLES for restaurant services, finding that Respondent Del Taco abandoned use of the mark beginning in 1995, for a period of more than three consecutive years without an intent to resume use. Christian M. Ziebarth v. Del Taco, LLC, Cancellation No. 92053501 (March 31, 2015) [not precedential]. 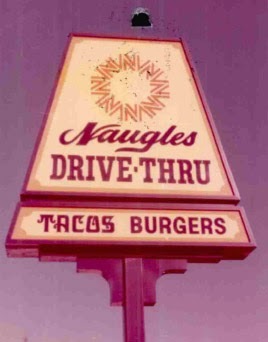 Respondent Del Taco acquired the original NAUGLES restaurant chain in 1988. Its last NAUGLES restaurant closed in October 1995 and Del Taco has not re-opened or operated any NAUGLES restaurant since then. Petitioner Ziebarth, an "online blogger" [Is there such a thing as an off-line blogger? - ed. ], detected some interest in the return of the restaurant and filed an application to register the mark NAUGLES for "cafeteria and restaurant services" in May 2010. The mark was refused registration under Section 2(d) in view of Del Taco's registration. Standing: Even if an application is barred by a prior registration, applicant's standing to seek cancellation of that registration may be challenged on the ground that the applicant lacked a bona fide bona fide intent to use its mark when it filed its ITU application. Here, however, the evidence showed that Ziebarth took active steps toward using the mark, including discussions regarding possible locations, financing, and marketing. He purchased the domain name www.nauglestacos.com and there operates a website called "Naugles Tacos and Burgers." The Board therefore concluded that Ziebarth had a bona fide intent to use the mark NAUGLES when he filed his application to register, and therefore he has standing in this proceeding. Abandonment: Section 45 of the Lanham Act provides that a mark is abandoned "[w]hen its use has been discontinued with intent not to resume use. Intent not to resume use may be inferred from circumstances. Nonuse for three consecutive years shall be prima facie evidence of abandonment." The ultimate burden of proving abandonment remains with the petitioner, but if a prima facie case is established, respondent has the burden to produce evidence that it either used the mark during the statutory period, or intended to resume use. Respondent Del Taco's own witness testified that "Del Taco stopped using the NAUGLES trademark as the actual name of a restaurant on October 25, 1995," and respondent admitted that during the years 1995-2010 it "did not own a restaurant to the public [sic] named 'Naugles.'" Nonetheless, Del Taco contended that it never stopped using the mark in connection with restaurant services, and that since 1995 it used the mark "in advertising and on clothing." The Board, however, pointed out that use of the mark on clothing is not service mark use. For a service mark, use requires that the mark be used in the advertising or sale of the services and that the services be rendered (as the CAFC recently held in Couture v. Playdom). Here, the services were not being provided, and so Del Taco could not rely on any purported sales of clothing to refute the abandonment of the service mark. Respondent Del Taco's witness pointed to evidence purportedly showing website use of NAUGLES during the period 2003-2006, but the Board noted that the proffered webpages were merely historical in content and were "clearly not advertisements for contemporaneously-rendered restaurant services." In any event, this supposed evidence did not rebut petitioner's prima facie claim of abandonment for the years 1995-2003. Del Taco claimed that it incorporated the NAUGLES mark into its "Del Taco" restaurants by way of a purported "secret menu," which is not an actual menu but a "concept" that allows customers to request food items (namely, a "bun taco" and a "MACHO bacon and egg burrito") previously offered in Naugles restaurants. But there was no evidence that the NAUGLES mark appeared on advertising materials or that Del Taco promoted the Naugles "secret menu." Nor was it clear that the mark NAUGLES was itself referred to in connection with the "secret menu." The Board concluded that the sale of food items previously sold at NAUGLES restaurants cannot be construed as use of the mark by Del Taco. Finally, Del Taco claimed to own "considerable goodwill" in the NAUGLES mark, but the Board pointed out that it "has never found residual goodwill to be a defense to abandonment." "The continuing existence of enthusiasts of the old Naugles food items does not negate the statutory presumption of abandonment." The Board found that Petitioner Ziebarth had established a prima facie case of abandonment. The burden shifted to Respondent "to prove that it either used the mark during the statutory period or intended to resume use." [Actually, as noted above the burden to produce evidence shifted, not the ultimate burden of proof - ed.]. The remaining question was whether Del Taco intended to resume use during the period of abandonment. Del Taco pointed to certain materials from 2009-2010 purporting to show plans for a new advertising campaign called "NAUGLES Secret Menu." However, even if those materials showed an intent to resume use in 2009, "this is much too late to save Respondent's registration." Once a mark has been abandoned, the abandonment cannot be undone, and a registration of the mark can be cancelled on that basis notwithstanding any later use or intent to resume use. "Merely because a party used a mark a long time ago and it could use the mark in the future is not sufficient to avoid abandonment." In conclusion, the Board ordered cancellation of the subject registration, observing that "[T]he Lanham Act was not intended to provide a warehouse for unused marks,"
TTABlog note: Absent reversal of this ruling on appeal, Ziebarth's application will proceed to publication. What if Del Taco opposes on the ground of Section 2(a) false association? Do you think that claim could succeed? A reader notes that Del Taco renewed the registration in 2006, well after it stopped operating Naugles restaurants. Was there a claim for fraud? Reminds me of the Bose case, where the renewal papers were signed by an executive who thought the mark was still in use, and so there was no bad intent. Can downloadable software trademarks ever become abandoned if they are still used on a website somewhere? I was reading this article and wondering if things like archive.org or search engine cache content would ever confuse the board, but obviously they're well aware of the real world use tied to a mere online display of a mark. But for downloadable software products, would an archive.org historical - yet functional - webpage be continued use? Assuming that Naugles is a person, institution, belief or national symbol. If it is a person, doesn't the Kent Petersen test require that the senior mark be "used", and since the TTAB has already established that it is not, think the 2(a) argument fails as a matter of law just like a 2(d) argument would. This case got a decent amount of press here in Southern CA, including a front page spread in the Business Section of the Orange County Register over the weekend. I was lead counsel for Petitioner. Both Petitioner and Del Taco are based here in OC, and, even before the opinion came down, there were multiple articles on this "David v. Goliath" case. I have been happy to see a trademark case get so much attention. Side note: I will be at the "Trademark Office Comes to LA" event on April 14th, and I look forward to hearing you speak, Mr. Welch!